This is a family favorite around here, the aroma of the sauce wafts around the house better than any home fragrance on the market. 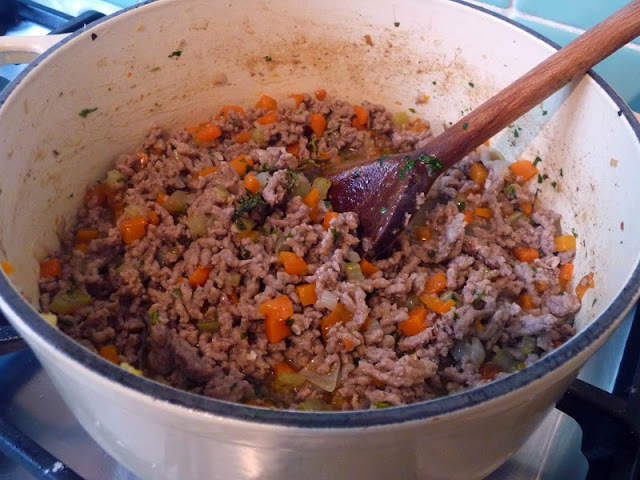 You can use veal mince or 50% veal and 50% pork (my favourite), or if you can't get hold of any veal at all, then pork will work as well. The key to this is allowing the sauce to reduce properly which should take around an hour, leaving you with a succulent, almost sticky sauce that hugs onto the pasta. 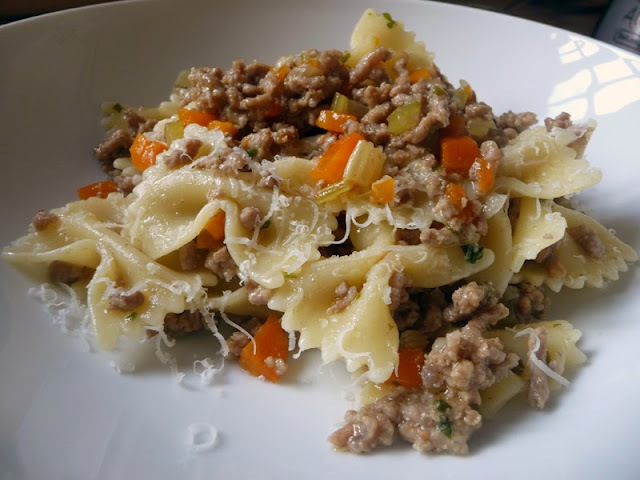 This sauce is best served with a smooth pasta shape, traditionally farfalle (bows). You could use penne, preferably unlined, but never, ever long pasta like spaghetti. Heat the olive oil in a saucepan before adding the chopped celery, carrots and onion. Cook gently for 10 minutes until softened. Turn the heat up reasonably high and add the mince, stirring until browned all over - you want the meat to sizzle not stew. Add the wine and cook until evaporated. Then add the stock, lower the heat and simmer until this had reduced down almost entirely, about 30-40 minutes. 10 minutes before it is cooked, add the chopped parsley, thyme and season well. The meat sauce should be quite succulent but if you wanted to add a little more olive oil so it coats the pasta well you can. Serve with pasta and shaved Parmesan cheese.